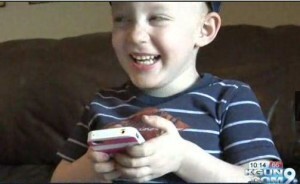 2 Year Old Uses FaceTime To Save Mother’s Life. A 2 year old boy is being held a hero after using FaceTime to save his mom after she was injured. Laura Toone was trying to break up a fight between a foster dog she had been caring for and one of her own dogs when the foster dog bit part of her middle finger almost completely off. Toone tried to call 911 herself, but she said her hands were too bloody to make the call. “I begged my daughter to call 911, they are four years old, they were too afraid to touch the phone because it was covered in my own blood from me trying to call for emergency,” said Toone. The mother continued to lose a lot of blood and thought she was going to lose consciousness. That’s when her 2-year-old son Bentley showed up with a dish towel from the kitchen. After wiping the blood off of his mother’s iPhone, Bentley proceeded to use FaceTime to call Toone’s friend Connie Guerrero. “All I could see was his little forehead, and I said ‘Hi Bentley’, and it was quiet for a little bit. And then I heard Laura screaming,” Guerrero told reporters. Guerrero then call 911, and Bentley unlock the door to let the firefighters into the house. Toone told reporters she is very thankful for her little hero and has now taught all of her children how to dial 911.